We’re committed to our customers. That’s why we’re always looking for talented people to join our team. 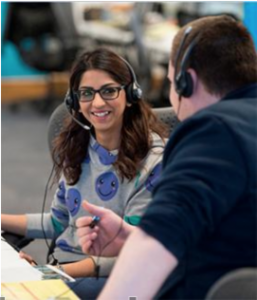 Want to know more about a career at one of our Contact Centres? In November we’re opening our doors to show you what it’s really like to work here. It’s a great opportunity to get a first-hand look at what we do, learn more about our training and career opportunities, as well as the chance to meet some of our fantastic people. Making every day amazing for our customers is a real team effort. That’s why we’re always on the look-out for enthusiastic and passionate people to join our teams. And what better way to find the right people than for us to get to know you over an informal chat and some refreshments. We have exciting opportunities for Contact Centre staff across multiple locations in Scotland, as well as Newcastle, Leeds and Stockport, Manchester. We’re looking for friendly individuals who are committed to delivering excellent service. If you’ve got the right attitude, we’ll give you all the training you need to succeed. What’s more, if you join us you’ll be entitled to a great salary and terrific benefits, including free Sky Q, incentives throughout the year, private healthcare and multiple discounts from retailers. Come along to our Sheffield Open Day on Saturday 16th February from 10:00 – 17:00 to find out what it’s like to work for Sky! To apply click on the link to your left. Working mum Lori has been able to balance life and work at our Contact Cent... Adam’s been able to influence decision’s within Home Service.